New Directions Publishing Corporation, 9780811218061, 185pp. 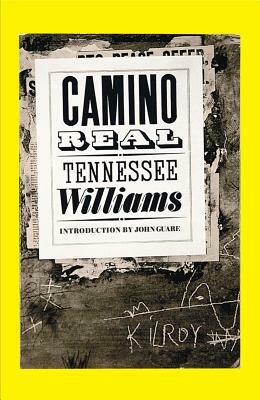 The acclaimed classic in a new edition, now with a new introduction, the author's original foreword and afterword, the one-act play "10 Blocks on the Camino Real," plus an essay by noted Tennessee Williams scholar, Michael Paller. In this phantasmagorical play, the Camino Real (pronounciation: "Ca-mino Real") is a long highway, a dead end, a police state in a vaguely Latin American country, a nightmare, and an inescapable condition. Characters from history and literature--Don Quixote, Casanova, Camille, Lord Byron--inhabit a place where corruption, starvation, indifference and greed have immobilized anyone who tries to escape. Then, into this netherworld, the archetypal Kilroy arrives--a sailor and all-American guy with "a heart as big as the head of baby." Like others before him in the Camino Real, Kilroy is robbed, conned, turned into a patsy, and he very nearly breaks...but not quite. When this experimental epic opened on Broadway in 1953, it confounded the critics, but not the audiences. The play's iconic/ironic humor, playful conceits, and towering concerns about society's demand for conformity, the courage of the artist, and the power of compassion have made it a classic.